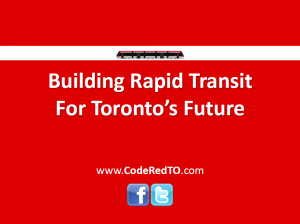 CodeRedTO was invited to attend a recent town hall meeting hosted by Scarborough Member of Parliament Dan Harris regarding the push for a National Public Transit Strategy. Presenters included Harris, fellow MP Olivia Chow, Toronto Councillor Janet Davis, and Joe Drew and Cameron MacLeod of CodeRedTO. As the event was related to public transit and being held in Toronto, we were invited to provide the facts about Toronto’s current transit expansion (including costs and funding), and to discuss the history of transit expansion in the city. Councillor Davis presented on the history of the TTC and the history of transit funding in Ontario. Click to see our short presentation from that meeting, and if you are interested in learning more about the National Public Transit Strategy, you can visit them on Facebook or on Twitter.